After arriving at the New Orleans airport, I got at the end of a huge line to grab a taxi. Finally third from the front, I noticed someone exit the baggage claim area and look at the taxi line with probably the same exhausted look I gave it. But this wasn't just any exhausted passenger. This was Sarah Dessen! Although I'd never met her in person, I recognized her from the cover of this month's Writer's Digest magazine. Since she's also a Penguin author, I assumed we were heading to the same place. She began walking toward the back of the ever-growing line, and after asking the guy behind me to hold my place ("Dude, I don't even know you"), I ran after Sarah. It was a scene right out of a very cheesy 80s movie. Guy runs through airport after girl, shouting "Sarah! Wait, Saraaaaaah!" The entire ride to the hotel, I kept thinking, "I'm sharing a taxi with Sarah Dessen. And she seems so...normal. Doesn't she realize she's Sarah Dessen?" Although I did get a couple of hours here and there to check out the city (a ghost tour, lots of eating, and trying to get people to throw beads at me), most of my time was spent at ALA-related events. 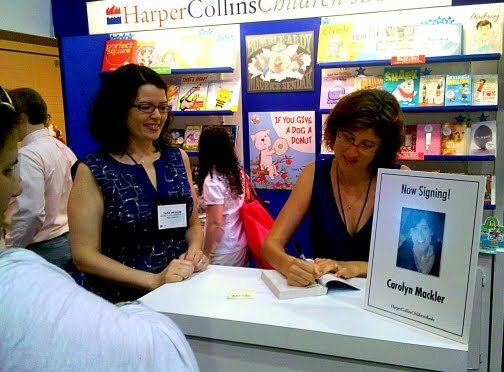 While Carolyn Mackler and I were there mostly to promote The Future of Us, we both had autograph times scheduled for our last books. When Carolyn signed Tangled, I just had to stop by. It's weird to think that less than a year-and-a-half ago, we hardly knew each other. When Carolyn finished signing, David Levithan and Sarah Dessen came over and the four of us began chatting. After several minutes lost in our own conversation, we realized that we were being watched. 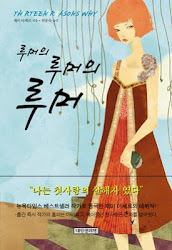 For the reverse view of the photo above, check out this post at Nori's Closet. Between my signings and speaking engagements, I stumbled upon a few brilliant authors and added to my collection of books. Random House held a party at a wax museum where they had someone reading tarot cards and another person drawing caricatures of attendees. Thanks to Phil Bildner (organizer of the recent author/illustrator It Gets Better video), I was able to attend this event and schmooze until way past my bedtime. The next day, during lunch with Tom Angleberger, I got a sneak peek at the premise of the third Origami Yoda book. Trust me, you're gonna love it! Penguin held a cocktail party that evening and each Penguin author sat or stood at a table, signing books for the librarians in attendance. One table was occupied by two authors who were making their first public appearance as collaborative writers. Don't they look happy? Early the following morning (and, again, I'd stayed up way past my bedtime), around 40 YA authors met at a nearby hotel for the Coffee Klatch. It's basically speed-dating with authors. A table full of librarians gets to speak with one author (or two authors if they happened to write a book together), for five minutes. Then someone blew a whistle and the authors moved to the next table. This event was also my introduction as the spokesperson for this October's Teen Read Week. So before the rest of the authors came in and sat down, I gave a little speech about being selected as spokesmodel...I mean, spokesperson...and gave the rules for the Coffee Klatch. For example, when I read through the names of the 40 authors as the authors walked in, the librarians were supposed to hold their applause until the end. Somehow I forgot my own rule as I read Carolyn's name, and soon the entire room was applauding for her. Carolyn and I had a lot of fun talking about our book in less than five minutes at a time. At the end of the Klatch, the authors gathered for a group photo. Unfortunately, Carolyn and I had to skip out early in order to make our next signing. As we waited on the side of the street for a taxi, I was about to change from my "spokesperson shirt" into something funny for our signing. I'd bought a t-shirt with the Facebook logo printed on the front, but the syllables were reversed to say BOOKFACE. As I was about to pull off my shirt to do a quick change, Carolyn suggested that I turn around first. Standing on the sidewalk were two librarians about to snap my photo. 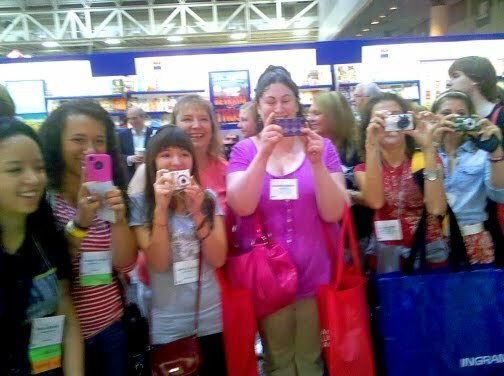 Since when did librarians become paparazzi? When we finally got to the convention (I changed inside the taxi), our mouths dropped open. People had been waiting in line for over an hour to get signed copies of The Future of Us! Then Carolyn and I did a video interview for BookPage, which I'll link to when they post it. That was followed by a pizza lunch with a room full of teens and librarians. We spoke for a half hour about writing our book, and then another half hour answering questions. Unfortunately, I forgot to grab my camera for that event. Even more unfortunately, Carolyn then had to leave for the airport to fly home. It'll probably be another five months before we're in the same place again, around the time our book comes out. Until then, I'll be having contests on my blog so you can win signed advance copies of The Future of Us. Before I also left for the airport, I did a bookstore signing with Maureen Johnson and Ingrid Law. By the end of that signing, I really started to feel the effects of missing my bedtime several nights in a row. I was also really missing my family back in California. Thankfully, the night before I left home, I'd installed Skype onto JoanMarie's computer. This is from my very first night in New Orleans. I'm in New Orleans right now for the American Library Association's annual convention. The convention hasn't started yet, but I'm already starstruck by all the amazing authors I've been running into. I'll post a summary of ALA (with pics) when I get back, but I can't wait to tell you about a couple of very cool things I learned right before I got here. Thank you all so much for continuing to feel like this is a story you want other people to know about. After I calmed down from that news (just kidding...I haven't calmed at all! ), I heard from a 24-year-old reader in Pennsylvania, Kerianne, who had this tattooed above her ankle. 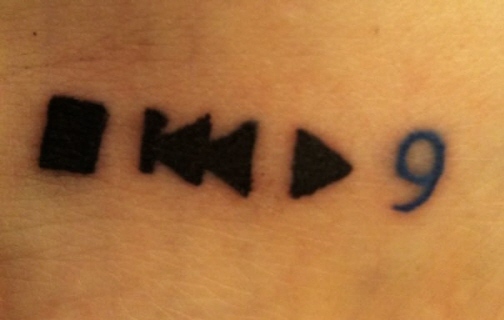 It's the Stop, Rewind, and Play icons, to remind her that you can't change the past, you can only press Play. And the blue number 9 is a reminder of reason number nine. It's a reminder to not believe rumors, to have empathy, and to care for others. Those are definitely great ideas to remember forever, which is a great thing because...it's a tattoo. Later this week, I'm heading to New Orleans for the American Library Association's huge annual conference. I'm a Cajun food nut, so I plan on spending a whole lot of my free time sampling fried green tomatoes, blackened chicken, cornbread, and beignets all over town. Of course, I'm not going there just for the food (in case anyone associated with my publisher is reading). I'm also going on a ghost tour! And I'm also going to meet a whole bunch of very cool librarians from around the country to talk about, and sign copies of, my books. In fact, that is what I'm most excited about. But before I list my signing schedule, I want to share a video with you. A few weeks ago, Phil Bildner asked if I would contribute a short clip for a group author/illustrator video he was putting together. The It Gets Better Project is one of the most beautiful uses of the internet, providing desperately needed hope and understanding to so many teens and adults. I am honored to be included in this video. Last Saturday was Isaiah's 6-month birthday. We spent the day at the beach with family and friends, and are still scraping sand out of his cute-n-pudgy skinfolds. 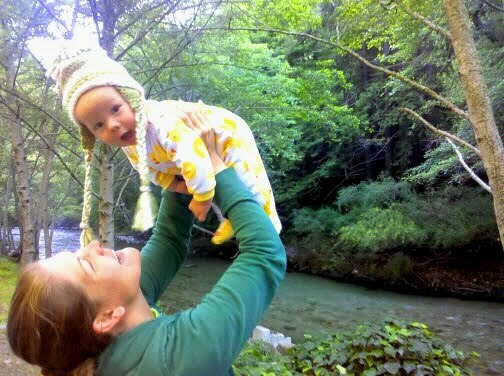 The next day, JoanMarie and I took him on his first camping trip. Watching him contemplate his first campfire, sleep in a tent, and wake up to the sound of a nearby river made camping seem more magical than ever. Then we took him to his first ghost town. Most ghost towns have a long and haunted history where the buildings are located. This ghost town is different. The old wooden buildings were brought in from all over in the middle of the last century, so any ghosts who came with them suddenly had new ghosty neighbors. Our friends Mary and Peter Weber pulled some strings to get us into this private ghost town, and our families spent several hours playing Ghostbusters. There were even haunted firetrucks. Though it was Isaiah's half-birthday, JoanMarie and I were excited when a package was delivered for us. The diapers we ordered finally arrived! Isaiah was just happy when we finally emptied the box. But Isaiah's half-birthday is over now. It's time to make room for Father's Day!!! I read a lot of magazines and have 2 or 3 subscriptions at a time, but the one I've subscribed to the longest is Entertainment Weekly. I love that magazine! In my recent post about my family's trip to New York City, I mentioned an interview and photoshoot that I couldn't tell you about at the time. Well, go out and buy the latest issue of EW! 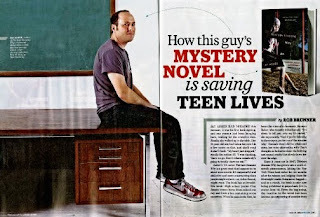 My favorite magazine includes a feature article on Thirteen Reasons Why and me! 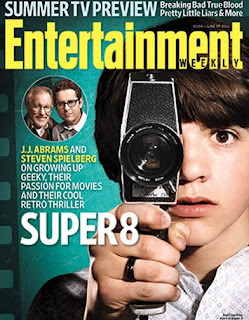 I found out EW wanted to interview me shortly before we left for New York. But I didn't know I'd be doing a photoshoot until after we landed. In a way, that was probably good because I would've stressed too much about what clothes to bring. Instead, I showed up with what I had. The hair and make-up artist said my hair looked fine. When I told her that's because I go to Supercuts, she gave me a high-five. She also loved my shoes, which I told her I got at Ross (Dress for Less), which earned me another high-five! The session started by taking some photos with a window-view of NYC over my shoulder. Then they took some shots of me sitting on a desk in front of a chalkboard. 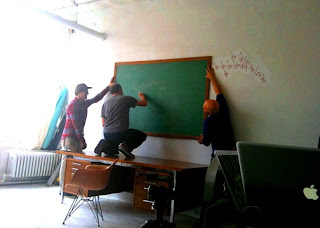 At one point, I wrote "Everything affects everything" on the board. 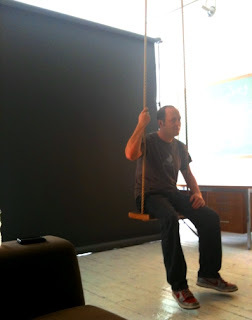 Then I noticed a swing attached to the ceiling that had been pulled out of view. That seemed like an obvious prop, so they took a few photos of me sitting, standing, and swinging on that. When I left the photoshoot and headed back to meet JoanMarie and Isaiah, only one thought played over and over in my mind. "Dude, I'm going to be in Entertainment Weekly!" Thank you, Rob Brunner. You somehow boiled down two hours of my rambling into a great article, getting me to talk about aspects of writing I've never opened up about before. Thank you, John Huba. You and your crew were so much fun to talk to and laugh with, keeping me from feeling too nervous about...y'know...having my picture taken for my favorite magazine! And thank you, Elyse Marshall. You always handle everything related to Thirteen Reasons Why with so much care. Librarians allow authors to feel like rock stars. And since I used to want to be a rock star, Thursday let me live that dream a bit. But I almost didn't make it to my own show! Back in California, I was supposed to wake up at 5:45am to catch the first of three flights to get into Laredo, Texas the day before my event. My phone rang at 5:15am and I was told that one of my flights was cancelled. So the airline took the liberty of rebooking me to arrive the next day...90 minutes after the event started (and since I'm not an actual rock star, that just wasn't okay). I stayed on the phone until we figured out a plan to get me there on time. I arrived much later the night before my event than I planned, especially since I had a TV interview scheduled for 6:30am (or 4:30am California time). Few things make me happier than when communities use my book to start discussions on issues that are otherwise difficult to bring up. In preparation for my visit, not only did Laredo have a discussion about Thirteen Reasons Why, they also held an anti-bully & suicide awareness rally. Students who attended both events got that ticket above for a meet-n-greet right before my public presentation. Then the chairs started filling and it was on with the show! This was my last school or library visit for a few months, and things definitely ended on a high note. Thank you, Laredo. You rock! I love going to my mailbox! Once a day, I get to slowly open the metal door and peek inside, filled with the hope that the Mail Carrier brought me something good. Unlike Santa Claus or the Easter Bunny, the Mail Carrier visits me six days every week. On days that I've been bad, she stuffs my box with bills. But every Friday, whether I deserve it or not, she brings me Entertainment Weekly. And on days when I've been really good, she brings me something extra special. 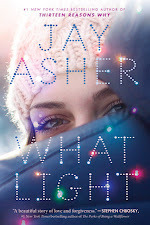 Recently, the Mail Carrier delivered a shiny gold medallion because Thirteen Reasons Why won the Young Adult Book Award given by the South Carolina Association of School Librarians. I wasn't able to accept the award in person, but the librarians knew the Mail Carrier would deliver this beautiful award safely and soundly. Also in the mail recently, SLO Life Magazine, which had interviewed me for their cover story (which you can read here). I'll admit, it's been fun to walk around town and have people recognize me and come up to chat. Because of one answer I gave in the interview, a guy at the gym admitted that he has Vanilla Ice on his iPod. Very few people will admit that! Doesn't Isaiah look proud of his daddy? 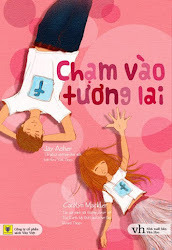 Finally, last month I did a blog interview with Naomi Canale. In that interview, I use the first line from the first Peanuts comic strip as an answer. Later, on Facebook or Twitter or somewhere, I mentioned that I would love to have that strip on a t-shirt. Well, Ms. Canale remembered a photo I shared of Isaiah in a Charlie Brown onesie, and made me a shirt that included more than just that comic strip. Don't I look like a very proud daddy? 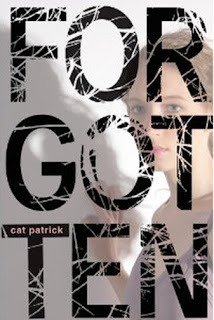 In my Don't Forget This Contest post, celebrating the release of Cat Patrick's Forgotten (which I blurbed! ), I asked you to tell me two things you're always forgetting. Using random.org to select a winner, a whole pack of goodies is going to someone who always forgets to knock on the door before she walks in, and forgets to take off her slippers when she goes to the car before school. To claim your prize, send your mailing address to EmmaNelson4Ever[at]aol.com (but use @ insteadl of [at]). In case you're wondering, that's not my email address, but the email address for one of the main characters in The Future of Us. The official release date of Forgotten by Cat Patrick is June 7th, but it's already popping up around the country. I guess booksellers can't wait for you to read this story! A quote on the back cover says "Forgotten is a mind-bending experience that I devoured in one sitting. Cat Patrick's exciting and impressive debut still haunts me." Even though whoever said that (okay, it was me) probably wrote those words months ago, I bet the book still haunts him (it does). Every night, while sixteen-year-old London Lane is asleep, her memory of that day is erased. In the morning, all she can "remember" are events from her future. London is used to relying on reminder notes and a trusted friend to get through the day, but things get complicated when a new boy at school enters the picture. Luke Henry is not someone you'd easily forget, yet try as she might, London can't find him in her memories of things to come. When London starts experiencing disturbing flashbacks, or flash-forwards, as the case may be, she realizes it's time to learn about the past she keeps forgetting—before it destroys her future. After entering, check back on Tuesday to see if you've won. There's no need to leave your email because I'll tell you how to send me your mailing address when I announce the winner. Good luck...and don't forget to check back! Before The Future of Us is released, Carolyn Mackler and I plan to tell you a bit about how we wrote the book. It was definitely a fun and interesting experience! But in this post, I want to show you how we edited it. One goal of editing is to make the story smoother and smoother. Of course, focusing so intensely on anything for so long will make you a little loopy!